BigCommerce, as well as Shopify, are two well-known brands and top performing e-commerce platform. It is often confusing to choose one between the two. Both BigCommerce, as well as Shopify, has its own advantages as well as few downsides. Before we see any further, let us first check a few details about both BigCommerce vs Shopify. BigCommerce like most of us know is a privately held technology company that develops e-commerce software for business. It is a medium tier company and was first launched in 2009. BigCommerce has its headquarters in Austin, Texas and has offices in San Francisco, California, Sydney,and Australia. To its credit, BigCommerce reports that $16 billion in total sales is processed by the BigCommerce platform. Now next let us check about Shopify. Shopify again is a medium tier company. It has its headquarters in Ottawa, Ontario, Canada. It was first launched in 2004 by Tobias Lutke, Daniel Weinand, and Scott Lake. The company reported that it has over 600,000 merchants using the Shopify platform. The net sales through this platform exceed $55 billion. Having provided a background about these companies, let us now do a comparative study of both these platforms. Let me start with this the most relevant piece of our comparative study. Yes, that certainly is the pricing model for these two platforms. We will check the plans and also the pricing for BigCommerce first. BigCommerce provides 4 different plan options. The cheapest solution starts at $29.95/month. The plans are as provided below with their respective pricing. Enterprise Plan Custom pricing This is a high-end plan and has advanced features along with dedicated customer support and full management of your website. For the Plus and Pro plan, in case you choose a plan for 1 year then you can avail a 10% discount. Next, let us check the Shopify plans and pricing details. Shopify has 4 different plans as shown below. To top all this Shopify also has a Shopify Lite plan. This plan allows you to sell on social media, in person or on an existing website. The plan starts at $9/month. 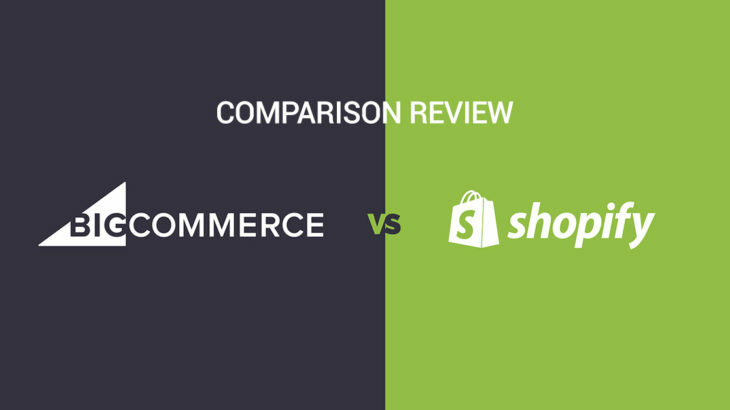 From the above comparison is clear that both BigCommerce and Shopify have almost a similar pricing model. Their plans are almost equally at par,especially for the lowest priced plans. However, knowing the price alone does not help. Since each of this platform provides different functionalities and features for each of this plan. So definitely it is best to also check their details features before committing to any specific plan. Further, in this review, I will unleash every minute detail about features as well as more. It is extremely common that most platforms look at ways to mint money. The most common way is by imposing a transaction fee. Transaction fee helps e-commerce platforms monetize their business. BigCommerce clearly states that it charges no transaction fees or rather it is 0%. Well going further, you would realize there are no transaction fees if you use any of their list of mentioned leading payment gateways. So to say, their list of payment gateway is huge and has support for almost 100 popular payment gateways. It is almost unlikely that you may end up using any other payment gateway apart from the once mentioned by BigCommerce. Either way, this looks to be a fair deal and we could simply consider the transaction fees with BigCommerce at 0%. With Shopify, you do not have to pay a transaction fee if you use Shopify payment which is powered by Stripe. In all other cases, a transaction fee is applicable based on the plan you choose. The issue with Shopify payment is its lack of support to certain geographical regions. The countries which include Shopify payments are- United States, Canada, United Kingdom, Ireland, Australia, New Zealand, Singapore and Puerto Rico. Below is a snapshot of their charges. So technically yes, Shopify charges transaction fees. This is something that happens to be better in BigCommerce as compared to Shopify. Payment gateways supported is yet another crucial parameter. This defines your strategy to spread your online business globally. While choosing the right payment gateway, you would have to consider several points since this is something that will impact your business in the long run. BigCommerce supports a wide range of popularly known payment gateways. Some of these are- AliPay, AmazonPay, PayPal payment pro and several others. This has over 100 payment gateways which are supported. BigCommerce also supports certain locally popular payment gateways within a specific geographical region. It provides a comprehensive list of different payment gateways supported based on the country. Shopify supports Shopify payments along with other popular payment gateways. Shopify also supports over 100 payment gateways. This includes PayPal, Amazon Payments, 2Checkout, Authorize.Net to name a few. Shopify provides a complete list of payment gateways supported based on the country. Both BigCommerce, as well as Shopify, have great payment gateway support. This is something you need not worry about. All you need to do is select the payment gateway that will be conducive for your online store. Features is another important parameter to be reviewed since you need to be sure you get all that is required for your online store. Both BigCommerce, as well as Shopify, provide an array of intuitive features. Let us check each of this one by one. Responsive: Well, you do require your website to be responsive. This is important since most of the online selling is done over mobile. BigCommerce creates a responsive website by default. When the same comes to Shopify, this too is completely responsive. Single Page Checkout: Both platforms support single page checkout. Apple Pay: BigCommerce supports Apple Pay, while Shopify directly does not have any such support. Discounts, coupons, gift cards: This can be easily added on both the platforms. Real Time Shipping quotes: This provides shoppers the most accurate shipping price available. This again is only available in BigCommerce. Reporting and analytic tools: Both platforms support multiple tools for reporting and analytics. 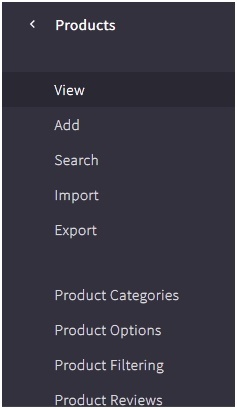 Other advanced features included in BigCommerce include- Google customer review, product filtering, price lists, unlimited API calls, ShipperHQ shipping rules engine. Some of Shopify’s advanced features include- unlimited number of products, unlimited file storage, fraud analysis, manual order creation, advance report building. BigCommerce and Shopify, both are feature rich. Customer support is something you would need in times of crisis as well as to resolve your queries. Let us check how good is both these platform’s customer support. BigCommerce has a good customer support and over its website, you would find multiple dedicated resources. The knowledge base is information rich. Also included are few video tutorials. You can reach their customer support directly over live chat, phone or email. BigCommerce also has a forum and community support. Shopify has an excellent customer support and provides loads of knowledge base. The knowledge base covers almost every topic which is required for e-commerce development. Also available is a list of the FAQ. You can easily access their help center and browse through the different categories to find more information. Shopify also provides community support and you can hire an expert if required. Apart from this, you can also explore their live chat or call or email options. It provided dedicated 24/7 support. Overall, both platforms have incorporated best industry standards to make their website information-rich as well as provide quick support to its users as well as potential customers. You definitely do not want to take any risks when it comes to your online store security.A constant concern is the security of your online store as well as customer data. BigCommerce provides dedicated SSL as well as supports custom SSL. BigCommerce supports several apps which can prevent fraud and enhance security. Few of these are Signifyd, NoFraud Fraud prevention,and many others. BigCommerce is PCI compliant. It can prevent DDoS attacks. Shopify maintains Level1 PCI compliance. This ensures user data is secure at all times.With no additional cost, you receive an SSL certificate. This is a 128-bit SSL certificate to keep user information secure at all times. This is the same level of encryption used by large banks around the world. Moreover, Shopify allows users to report their security concerns so that this can be handled appropriately. Shopify accounts are password secured and have robust password policies. These are protected against phishing scams. You can also enable two-factor authentication. Trial period helps users to check the features they wish to use. Both BigCommerce, as well as Shopify, have a trial period. 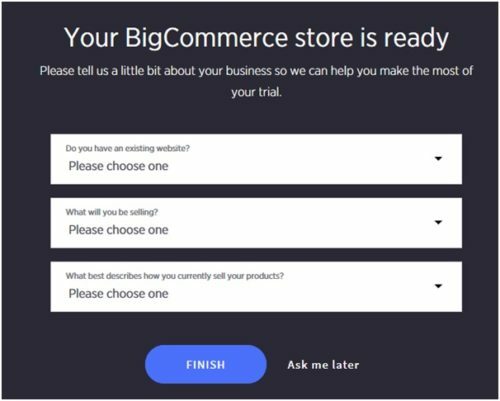 BigCommerce has a 15-day trial period. You can register and try most of the commonly used functionalities over here. Shopify provides its users a 14-day free trial. 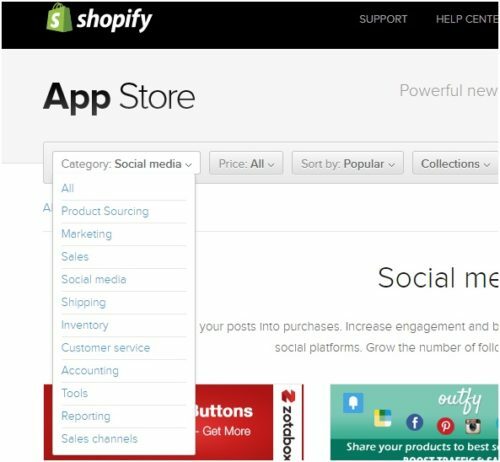 With this account, you can explore all the essential features available in Shopify. This is a great way to check all features before committing to any specific plan. For BigCommerce you need to first register and then it has few questions related to the online store that needs to be answered. Below is a screenshot of the same. Once you finish providing all the details, you will be directed to BigCommerce’s dashboard. The dashboard has several options as shown below. The dashboard design is user-friendly and is easy to navigate. 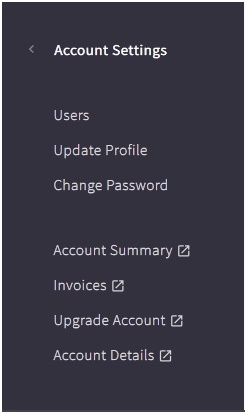 You can manage your account settings using the dashboard. Below is a reference screenshot showing all the options available in the account settings. Other options included in the dashboard are as shown below. Similarly, Products also has multiple options available. This ranges from product filtering to reviews. This covers almost every essential aspect required for an e-commerce store. Below is a snapshot of the products tab. If you explore the marketing tab, you would find multiple options. This is as shown below. Similarly, BigCommerce cover a huge analytics support. Some of the options available are as shown below. BigCommerce app store supports over 800 apps across various categories. Other configurable items available in the dashboard is Store setup details such as Payments, shipping, the point of sale etc. Multiple advance settings such as web analytics, checkout, inventory to name a few. Next, let us check speak more about Shopify. Starting to use Shopify is extremely simple. You have to register and provide your store name. Following this, a page displays with few basic details as shown below. After providing a few more basic details, you can start accessing your account. 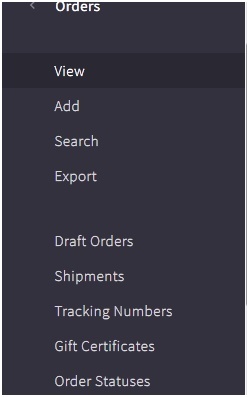 Below is a screenshot of the dashboard for Shopify. On a closerlook, you would find this extremely simple to decipher and use. It has a clear alignment and category mentioned. Needless to mention all the tabs are well placed. This makes it a great platform even for novice users. You can complete configuring your settings by clicking on the “settings” icon which is provided below. The things you can control from here includes- payment, notifications, checkout, shipping, billing and few others. Below is a screenshot of the same. This provides flexibility to adjust all the essential parameter based on your requirement. At any point in time, you can change these configurations. The other options included are to monitor orders, watch for abandoned checkouts, product details, product transfer, inventory to name a few. You could also monitor customers and track their history of purchase. The analytics dashboard provides interesting insights about the store performance. This includes total sales, online store session tracking, finding returning customer rate, store conversion rate, average order value, total order distribution, sales by social source and there are many more. The analytics built on this is immense. Using their dashboard, you can also create discounts which are simple to create. You can add multiple sales channel. Below is a snapshot of the sales channels screen. Shopify has a dedicated apps support. This also can be accessed via the dashboard. You would find apps across all the different functionality. Shopify app support is one of the strongest points about Shopify. You can easily get access to over a thousand apps. Next important piece in the dashboard is the designing of the online store. Below are the set of options available for the designing of your online store. Here is where you find a couple of free themes. Apart from this Shopify has its own exhaustive theme store. 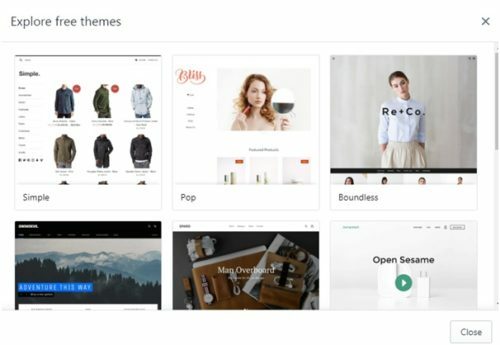 You could browse the theme store based on the category of your business. From here you can control and limit the number of pages as well as define navigation between pages. If you still need help, then you can hire a Shopify expert. Shopify as well as BigCommerce are easy to use. However, BigCommerce provides a wide range of choice and is more flexible. At the same time,BigCommerce is easy for experienced users. On the contrary, Shopify restricts the level of flexibility but is easy even for novice users. Analytics support helps you improve your site performance. However only analytics support is not sufficient. The analytics data should provide sufficient insights. 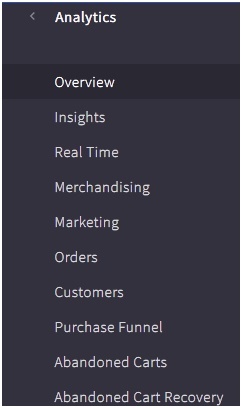 BigCommerce has a separate dedicated section for analytics. From the dashboard, you can get real-time analysis about your e-commerce store. This has statistics such as revenue, items sold, orders and visits. Apart from this it also displays the latest products sold. You can also use their merchandising statistics to improve your website performance. Other options included are- Marketing, Orders, Customer statistics, purchase funnel, abandoned carts, abandoned cart recovery, in-store search statistics, sales tax report. Along with this, you can also enable Google Analytics. While BigCommerce and Shopify provide great analytics support, Shopify has a more simplistic approach to display statistics. However, with BigCommerce the analytics is in more depth. Uptime is something I would like to review since this would determine the success of your online store. BigCommerce guarantees 99.99% uptime. It is built sturdy to handle tons of load. It has high speed and high-performance infrastructure along with constant monitoring which makes its services more reliable. Shopify guarantees a good 99.98% uptime. This would help you relax and not worry about your online store going down. Shopify takes all measures to ensure your online store is available at all times. With Shopify, you get unlimited bandwidth along with blazing fast servers. It uses CDN to provide fast speed. In terms of uptime both have good uptime metrics and provide equally reliable services. BigCommerce channel manager supports Facebook, Pinterest,and Buy Button. Apart from this, the other commonly used sales channels can be accessed via their app store. In terms of marketing, BigCommerce has an exhaustive support. 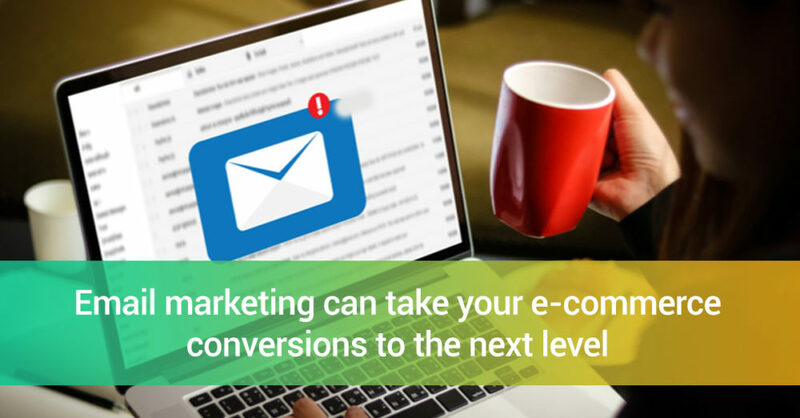 It supports Banners, Coupon codes, cart-level discounts, abandoned cart notification, Google AdWords, Yahoo search marketing, Google customer reviews, email marketing, gift certificates, eBay, Google shopping feed. Point of Sale (POS) – This allows you to sell products anywhere, anytime on any device using Shopify POS app. Facebook – Sell directly on Facebook with onsite checkout, and an integrated Shop tab on your Facebook Page. Instagram – Sell your products directly on Instagram by tagging products in your posts, to create a seamless shopping experience for your customers. eBay – Grow your business by seamlessly listing and syncing your Shopify products on eBay. Wanelo – Market your products on Wanelo and sell directly to millions of active mobile shoppers. These are a few channels which are available. Also, you can access other channels from Shopify’s app store.Also, you can use Facebook Pixel to create ad campaigns to find new customers that look most like your buyers. BigCommerce, as well as Shopify, have a huge sales channel and marketing strategies. Needless to say, you can skyrocket your sales by using these to your advantage. BigCommerce or Shopify, which one is better? This is difficult to infer, however, both these platforms are reliable and have a huge customer base. They are almost on par with their services. Both the platforms enable you to develop user-rich online stores. Shopify is easier for novice users, while BigCommerce is something that will be more appealing to experienced users. Whichever platform you choose, they do guarantee high conversion rates with their intuitive and feature-rich platform. Launch-ecommerce Bigcommerce, e-commerce platform, sales channel, Shopify, shopify app store. permalink.